Robert Griffin III should win the Heisman Trophy. From Baylor’s first game this year, when he shredded Gary Patterson’s vaunted TCU defense for 359 yards and five touchdowns, Griffin has consistently been the best performer in college football. He’s only a couple of yards shy of 4,000 for the season, he’s set an NCAA record for passing efficiency, and the former track star has rushed for 644 yards and nine touchdowns just for good measure. (Keep in mind “track star” isn’t just a way to say he’s fast; Griffin is literally a track champion.) Oh, sure, stats are stats — what matters is whether he’s a winner, right? Well, he won nine games at Baylor, a team that hasn’t done that since 1986. But is he clutch? Oh yeah, that. He’s clutch. Let’s look at Griffin’s first touchdown this past weekend, which came in a 48-24 maelstrom delivered on a Texas team that led the Big 12 in total defense. On the second play of the game, Griffin hit his top target, inside receiver Kendall Wright for a 59-yard score. 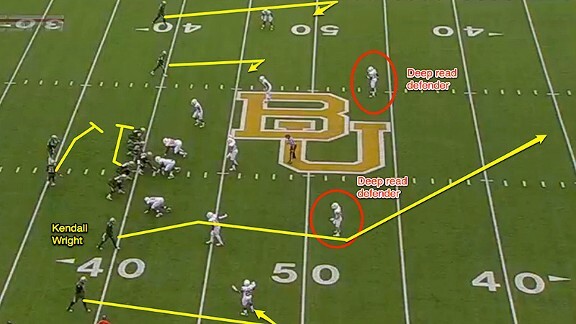 On this play, Texas lined up in a Cover 2 look with two deep safeties back, but the key for Baylor began in the backfield. 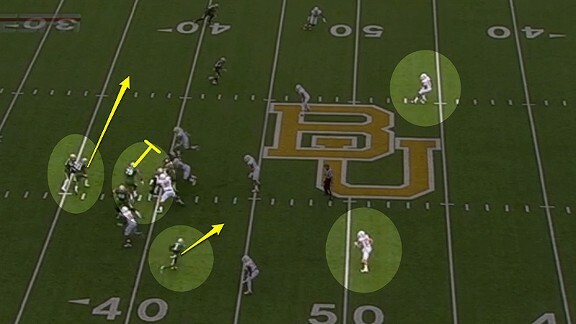 Baylor faked one of its best run plays, the “inverted veer.” Many think the play is like the zone read, but it’s not the same. 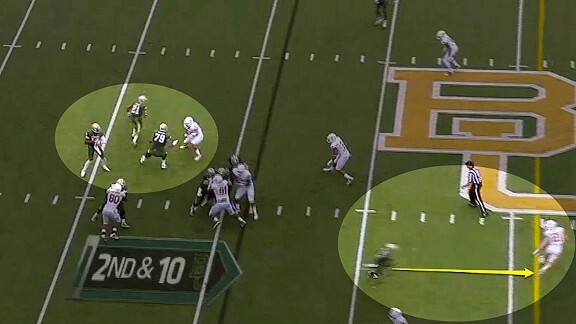 Instead, the line leaves the defensive end or outside rusher (here, a linebacker) unblocked while the running back, the dangerous Terrance Ganaway, takes a wide path toward the outside. The quarterback reads the defensive end, and if he stays put or flies into the backfield, the quarterback simply hands the ball off. But if the end widens for the running back, the quarterback keeps it and runs a power play inside behind a pulling guard. It was Cam Newton’s best play at Auburn last season. 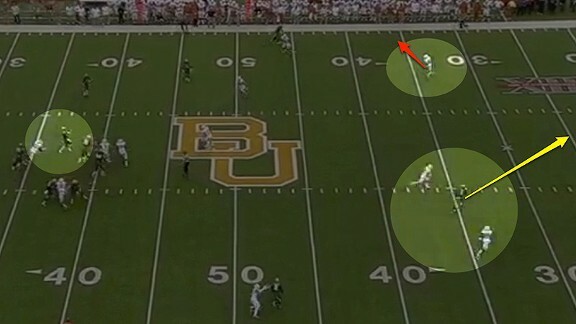 By showing this look, both Texas safeties find themselves peering into the backfield, particularly Blake Gideon. Wright helps sell the run by running (or “stemming”) his pass route inside rather than immediately running straight down the field. The result of the run action and Wright’s inside release is that Gideon, the near safety, is way too close to the line of scrimmage to be an effective deep-pass defender. At this point, Griffin knows he should be able to hit the deep ball, he just needs to figure out where to place it. That depends on where the safeties are located. From the wide view you can see Gideon has no chance, because he was fooled by the run action, while the far safety has widened so far to the opposite sideline that he is not in position to help on the deep pass to Wright. This might have been his responsibility — he might have expected Gideon to cap Wright’s deep route and prevent him from getting free — but in any event, that’s not Griffin’s concern. What is his concern is that his pass protection has broken down a bit, but no matter: He shuffles in the pocket, buys a little time, and throws one of those beautiful deep passes. The result: 7-zip, Baylor. I hope the other result is that Griffin takes home the Heisman. But as Matt Hinton recently noted, whether he wins or not, Griffin is undoubtedly the best to ever put on a Baylor uniform, and, ultimately, that’s the most impressive — and meaningful — distinction of all.